Maintaining your house exterior can be a tricky job, especially if you have multiple windows on high floors. Shiny Window Cleaning offers professional window washing services for your home, that saves you time, money and efforts. We use the safest and most effective methods possible, which preserve the cleanliness for longer and cause no disruption to your daily routines. And there isn’t any risk of damages to your property. All windows will be left spotless – the glass will be streak-free and all frames and sills will be wiped clean. Your home’s perfect appearance is just a phone call away. Contact us now for a free quote, or to receive more information. 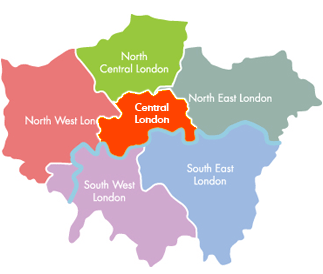 An experienced and fully equipped technician will arrive at your property with a small van. He will bring all the essential tools such as the extension water fed pole, squeegees, a ladder and everything else he may need to return the shine of your home exterior. We work with only the latest technology including water-purifying tanks and systems. The tank is situated in our van and that’s why we would need a parking space within 30-100 meters (100 – 300 feet) of your property on the same side of the street. If this isn’t possible, we will use our detachable system – a wheeled water tank. 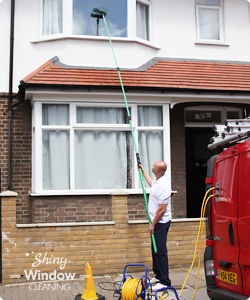 Your windows will be cleaned from the ground level using the extension pole. If there are some hard to reach places, we will perform a traditional cleaning using a ladder and a squeegee. In addition, we can take care of your inside windows using special detergents, that aren’t available over the counter. Store-bought products contain chemicals and often leave streaks on the glass. As a professional company, we utilize the best technique – the water fed pole cleaning, also known as reach and wash or pure water cleaning. This system consists out of a purifying tank and a telescopic pole with a special brush and water jets attached to the top. The pole is fed with deionised water out of the tank. The brush on top agitates the dirt and debris off the window while spraying water at the same time. At the end of the procedure, the brush is slightly lifted and the surface is rinsed by the pure water jets. Our water-fed pole can reach up to the 4th floor (30metres or 100 feet high). In case your glass panes are situated above this height, we advise you to take a look at our commercial window cleaning options. Purified water is the best glass washing solution according to the National Window Cleaning Association. It is filtered by a three-stage process, involving 1 carbon and 2 de-ionized filters. The de-ionized water acts like a magnet to dirt. It pulls all solids off the glass and dissolves them, so the windows dry clear without any water spots. The distilled water prevents from dust to build up and your window will stay clean for longer. It also leaves no streaks and eliminates the use of chemicals or soap, meaning the work will be done faster and in a more environmentally-friendly way. The liquid drains in the sewage, but it’s only water, so there is no risk of pollution. The pole’s brush is specially designed to protect the glass surface. You will have your glass panes cleaned gently, but to perfection. When the technicians are done, your windows will be streaks-free and you can enjoy the view through them again. Have in mind that we can also take care of the windows in your office, shop or another place of business, and help you impress your clients and partners with a perfect exterior look.